Poster displays, sign supplies are one of the easiest ways for a store to grab attention. Set them up on the sidewalk, hang them in the door, in the window, and they're ready to advertise for you invariably. Many of these sign supplies use bright colors, flashing lights, and other tools and tricks of the trade a part of their framing to get the customer's eye over your way. These aren't negative qualities, especially since signs with those attributes are incredibly popular and effective. You just might prefer more subtle and sleek sorts of sign supplies. So this question then must be asked. How is it that one of the thinnest, most unobtrusive sign supplies is also one of the most intriguing? It is precisely that - since you can't see much of this cable display system passersby become intrigued as to how exactly the display is staying together. Once they're closer, they can see the displayed posters that seem to be floating in mid-air and also help themselves to one of your promotional brochures in the attached pocket. These cable signage systems, sign supplies place the focus solely on your advertising substrates. By being so minimal the attention is firmly guided onto the posters and brochures, not towards the vibrant red or illuminated frame. The slender cords and nearly invisible frames provide a sophisticated look that is popular in Europe and expedient making its way over here. In fact, this high end sign supply features European design. 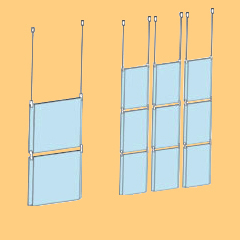 These cable display systems, also known as hanging poster displays, have a number of qualities that make them one of the most unique display setups for sale on this website. 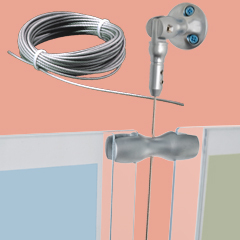 What are the individual pieces of equipment in this cable display system sign making kit? An acrylic sign holder that's either 8 ½" x 11", 18" x 24", or one that supports two letter sized images. An acrylic brochure pocket that measures 8 ½" x 11", or a multi-brochure acrylic pocket that is 11" x 17". A 1.7mm stainless steel braided cable that is coated in PVC to prevent fraying and measures either 16' or 82'. An angled mount and a fixed mount that are crafted from brass with a silver finish. Various clamps in different styles to support the posters being held in the acrylic sign holder above. All of these sign making pieces can be bought separately for wholesale rates in this category, allowing you to make a display that is truly customized to your exact measurements and specifications. Buy the cables and the brackets two hang two (2) signs, or buy enough to hang a dozen across a wall to make an expansive exhibit. The parts are inexpensive enough that you can create the display you want without doing too much damage to your wallet. However, we also have these cable display systems available in packages as well if you're looking for a smaller setup. One of the benefits of purchasing a system rather than the do it yourself benefit is that all of the cables are pre-cut for you, so you will not need any wire cutters or have to measure out cord in order to set up your signage. The display holders and mounting hardware are also included in this equipment kit, so all you have to do is choose which size holder will best fit your advertising posters. 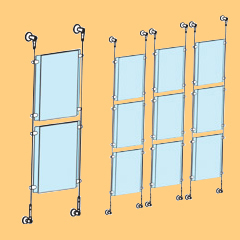 Multiple kits can also be hung together to make a larger display as well. Where can these cable hanging displays often be found? A clothing store in a mall could have this cable display system set up in the window displaying the latest glossy advertisements and hanging signs from headquarters with that season's trends. A company office suite could have this wall cable exhibit mounted in the wall showcasing articles and awards the company has received over the past years. This equipment would work great in the reception area of a salon, where you can display an advertisement or calming image above while putting promotional substrates in the brochure holder below. A doctor's office could use the equipment for a very similar reason. The travel industry would definitely find this display useful, showing off pictures of exotic locales above while setting up their promotional brochures and informational packets below. These hanging cable systems don't just have to be used in commercial industry or professional arenas. They would work great in a residential display to show off family photos or precious paper heirlooms. We offer two products with aluminum snap frame displays that provide a more upscale look than acrylic and would be perfect for home usage. A school could utilize these displays as well, to showcase a series of small maps or other educational substrates on the wall without taking up valuable blackboard or whiteboard space by tacking up pictures. 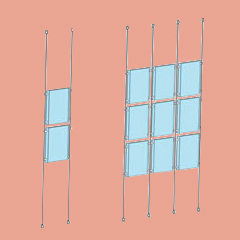 The displays with the snap frames are slightly more complicated to set up, as some clipping of the hanging cables is required (we send you 119" worth of cable and allow you to customize the length as you wish). The wholesale price of this sign making hardware makes it especially good for residential applications.